Pastor Randy T. Carlton is a humble and charismatic man of God; he’s a leader, teacher, and servant for the Lord. He is also a native of Irvington, NJ, born April 19, 1976, to Pastor Rudy V. and Lady Linda L. Carlton. Under the leadership of Senior Pastor and Overseer Rudy V. Carlton of the Jehovah-Jireh Praise and Worship Church Center (JJPWCC), Pastor Randy answered the call over his life, to minister the Gospel. In December 2006, he was appointed to serve as the Youth Pastor of JJPWCC. 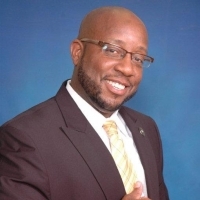 Since 2003, he has been the State Youth Director of the Full Gospel Baptist Church Fellowship International, State of New Jersey, under the leadership of Bishop Andre’ L. Jackson, State Bishop and Bishop Paul S. Morton, Presiding International Bishop. And since 1999, he has been committed to serve as a Youth Ministry Leader of Angelic Ministry. Additionally, he has continued to operate as a faithful Armor-bearer since 1998. Through his God given anointing to teach the Gospel, he has a strong compassion to minister to the youth. Pastor Randy exemplifies a benevolent affection to all adolescence. In his own intellectual style, he teaches them that “Compromise Is Not an Option,” through a series of sermons, which has been the theme for Thursday night Youth Bible Study and his Sunday morning youth services. Pastor Randy has been married to his lovely wife, Danielle, for 16 plus years. Through this union, God blessed them with four precious children, Sanaiya, Raquel, Rahmon and Shahara.